Midnight Update: As of right now five boats have finished and they have been allocated points as follows: Teasing Machine, France Green 2.5pts, Cutting Edge GBR Red 5 pts, Catapult Ireland 7.5pts, Hooligan GBR White 10 pts, and Eala of Rhu Scotland, has been allocated 12.5 pts. These are provisional scores and should the lower rated boats come with better corrected times the score will be amended. At 00.20hrs we can report that Antix has finished and has been allocated 35 pts which is doubtful that she will hold, and Quokka has also finished and has been allocated 20 points and may expect some slippage as well. More news later today (Tues). Variety has always been the spice of the Brewin Dolphin Commodores’ Cup with the 27 boats from France, Scotland, Ireland and England this week getting to sail a mix of inshores, offshores and a race around the Isle of Wight. At 09:30 BST today the fleet of three boat teams set sail from the Royal Yacht Squadron line of Cowes on the `Offshore Race’, the longest and most high scoring of the series. With a moderate wind forecast and the wind due to shut down tomorrow, the Race Committee, led by former Etchells World Champion Stuart Childerley, worked hard to set a fair but challenging course. 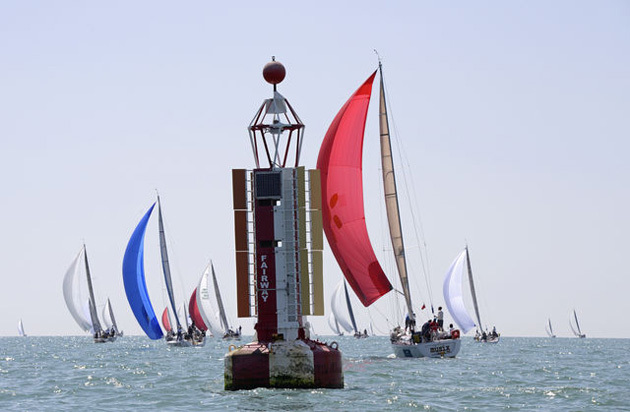 They opted to send the boats west out of the Solent, passing the Needles Fairway buoy then down to a ‘virtual mark’ mid-Channel, before returning north to the New Grounds Buoy off the Nab Tower, then on to the Bembridge Ledge buoy and leaving No Man’s Land Fort to port before the finish line south of Gosport’s Gilkicker Point. After a long starboard gybe in 10-15 knot NWN wind, at 1600 BST the first boats were rounding the virtual gate. At the front of the fleet the beamy Ker 40s were loving the conditions. GBR Red’s Cutting Edge and GBR White’s Hooligan VII had done a good job of fending off the `turbo-ed’ and higher rated Catapult, leading the Irish boat around the gate. They were followed 10 minutes later by Eric De Turkheim’s radical A13, Teasing Machine, sailing for France Green and followed at around 16:30 by GBR Scotland big boat, James McGarry’s Swan 45, Eala of Rhu. A gaggle of smaller boats, with yesterday’s double winner, Anthony O’Leary’s Ker 39, Antix, in front rounded the mark some 20 minutes later. While so far the race has not been overly tactical, this evening it will become so. The boats will head north on port tack in a westerly breeze but around seven miles short of the New Grounds Buoy, the wind is forecast to start veering into the NNW and drop substantially. This new breeze is expected to edge south through the evening meaning that the smaller boats will end up spending more time directly on the wind than the bigger boats. The wind is then likely to peter out completely on the race course around midnight, further favouring the big boats whose crews will be gunning to have finished and be on their way back to Cowes before this happens. After the whipping the French gave the rest of the fleet in last year’s Rolex Fastnet Race, the 12-strong French line-up is hoping to repeat their success in this year’s Brewin Dolphin Commodores’ Cup. The crew on the Gouy family’s Ker 39, Inis Mor, had been hoping for a longer offshore race. “We are very pleased to be here, but not pleased with our result yesterday!” said son, Laurent. “Obviously we have been focussed on the offshores for the last two or three years and we always have some difficulties in the Solent.” Of tonight’s grande finale Gouy predicted: “The wind will decrease quite a lot and with the tide arriving, the guys ahead will be more lucky than the guys behind. It will be about playing with the tide and the dying wind.” The pre-race routing had Inis Mor reaching the mark off Bembridge at 22:30-23:00 BST tonight. “The 10 miles will be in very little wind and with the tide against us,” warned Gouy. The series will continue on Wednesday and Thursday with more inshore racing followed by a shorter offshore course around the Isle of Wight on Friday that also scores bonus points. A single race concludes the event on Saturday. Yes, Ireland still tops the leaderboard after a heart stopping offshore race at the Brewin Dolphn Commodores’ Cup!! !